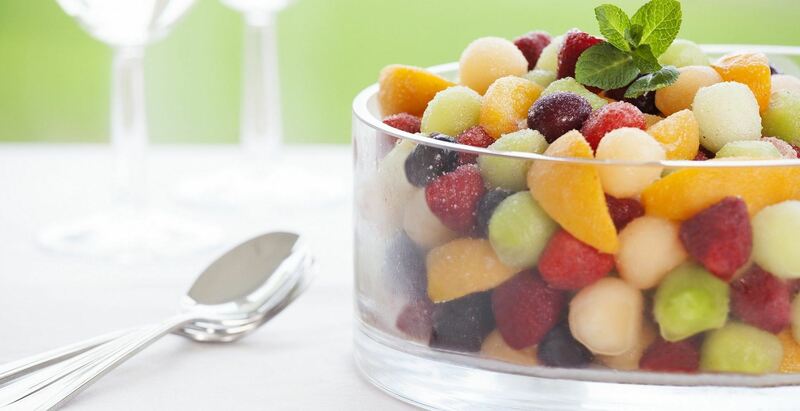 Sweet and refreshing frozen Honeydew and Canteloupe Melon Balls, Whole Camarossa Strawberries, Peach Slices & Flame Red Grapes. So simple - just thaw, serve and enjoy! Sprinkle with Grand Marnier or orange juice and allow to defrost. Fill sundae glasses with layers of fruit and Greek yoghurt or fromage frais. Or simply thaw and serve. Canteloupe and Honeydew Melon Balls, Whole Camarossa Strawberries, Peach Slices and Flame Red Grapes.